Hi, it’s Molly from Just a Little Creativity! I’m stopping by this October with a cookie recipe for you that my son and I created one afternoon after school. These cookies are both fun and delicious! We call these Monster Cookies. They’re the perfect creepy treat for the season. And can you ever go wrong with Nutella? No, definitely not. It’s my kryptonite, my all-time favorite chocolatey thing. Mix vanilla and oats in a large bowl. Add honey and then Nutella, and mix well. 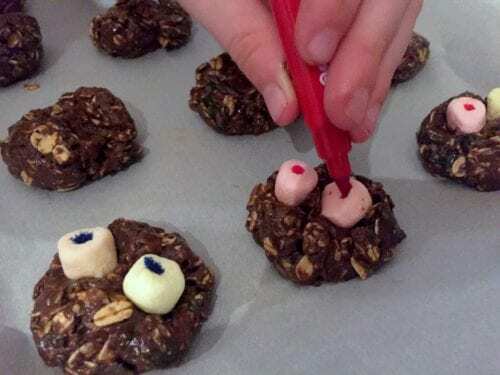 Roll the mixture into about 1.5″ size cookie balls while they’re sticky. Press a little dot into each cookie ball, and place the marshmallow. These are going to be the eyes, so add as many as you’d like per monster cookie. You may have to reshape the cookie a little around the marshmallow. 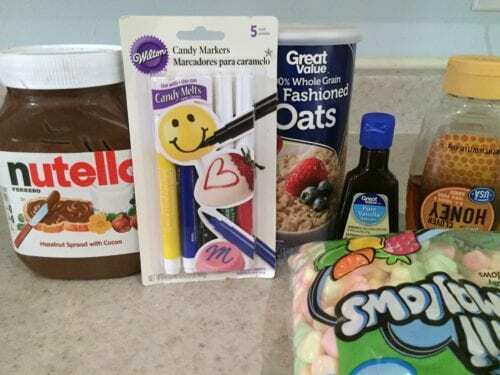 Use your candy markers to draw pupils onto the marshmallows. This is where you can be really creative. You can mix and match, add eyelashes, eyebrows, and more. My son’s favorite part is drawing on the eyes. We originally tried making these with the little candy eyeballs you can buy premade, but we didn’t like how hard they were. The large ones were like jawbreakers. 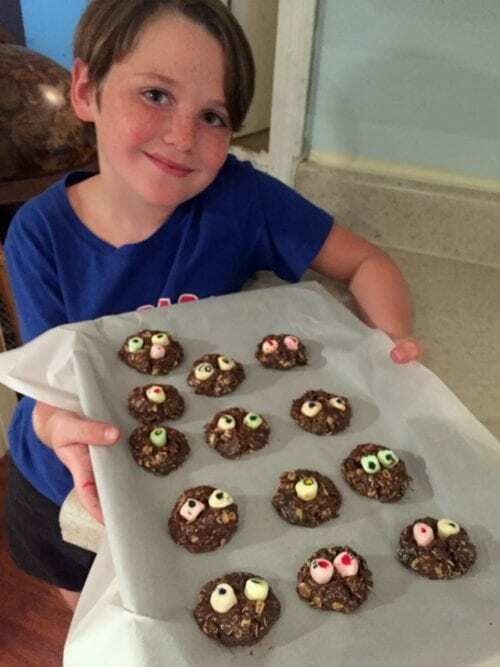 So, we invented our own edible eyeballs. He and I both agree that these were much more fun to make anyway. These would even be fun for a classroom or birthday party. 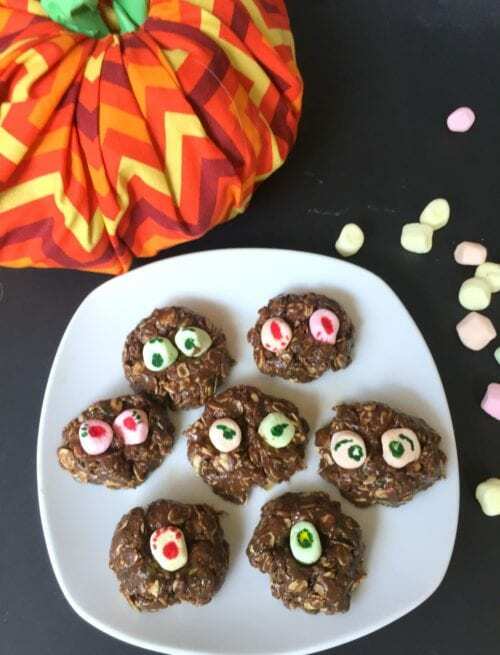 You could even allow each child to decorate their own cookie eyes. Let their little imaginations soar! It’s been my pleasure sharing this with you this month. If you like them, you may also enjoy my Grandmommy’s Peanut Butter Cookies I shared here this past summer. And if Nutella is your thing, I also have a Peanut Butter and Nutella Cookie Exchange Recipe available over at Just a Little Creativity. I’d love for you to stop by and say hello! Do you have a favorite Halloween Treat Recipe? Share and leave a comment below! 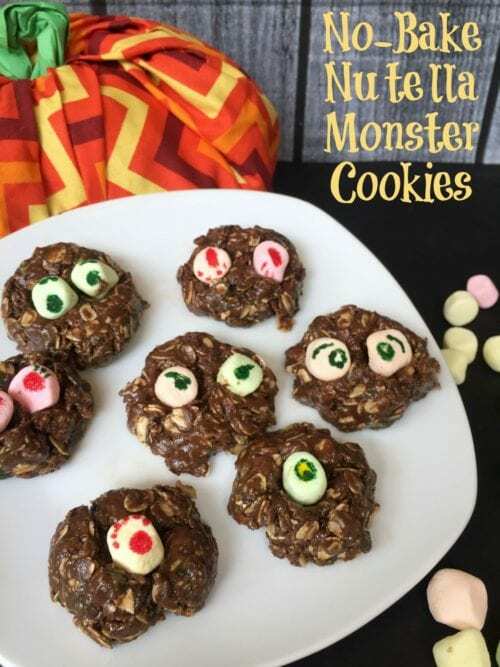 SAVE HOW TO MAKE NO-BAKE NUTELLA MONSTER COOKIES YOUR KIDS WILL LOVE TO YOUR FAVORITE PINTEREST BOARD! Thank you! 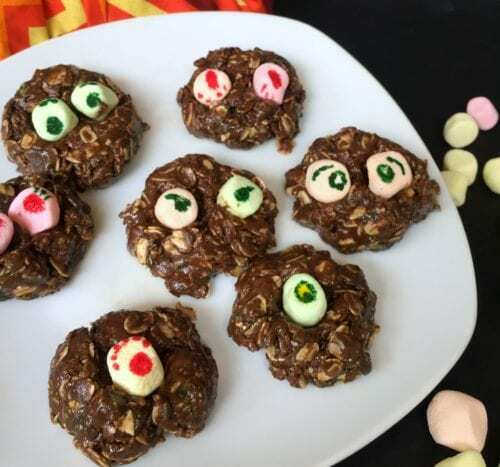 The are definitely a fun cookie to make around Halloween!